Cheddar, the “post-cable” news network, is making the jump to the gas pump. The company will now provide content to GSTV, which programs content to screens at more than 18,000 gas station pumps across the country. Under the terms of the deal, Cheddar will provide new segments to GSTV. The segments will be about 20 seconds long and focus on topics like technology and entrepreneurship. They will rotate in and out a couple of times per day to keep them fresh. “We have always had a bit of a news, sports, weather, editorial angle, and with great respect to some legacy publisher brands, they aren’t built for today’s consumers or today’s models,” Sean McCaffrey, president and CEO of GSTV, tells Digital News Daily, explaining why the company wanted to work with Cheddar. “It’s a nice story of everything old being new again,” Cheddar CEO Jon Steinberg says. “This is a platform that used to have traditional content, and now they are working with someone like us that has new content. Cheddar has grown its audience in part by trying to make itself as ubiquitous as possible. 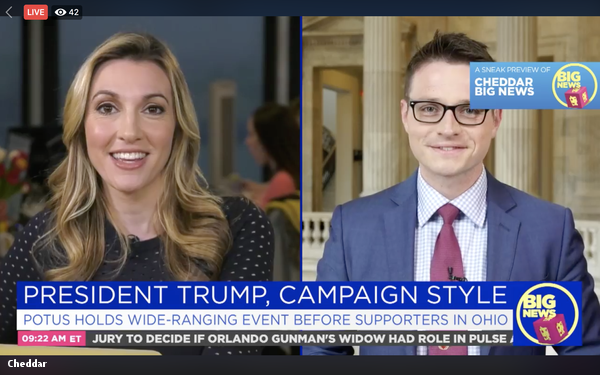 Cheddar and its general-interest news network Cheddar Big News are available on most streaming video bundles, such as Sling TV and YouTube TV, and even a number of traditional cable packages. The company has also embarked in a strategy to make itself available outside of traditional video bundles and social networks. It acquired MTV Networks On Campus and rebranded it as CheddarU earlier this summer, bringing Cheddar’s content to some 600 university campuses. “We are trying to mimic what traditional cable networks like CNN or CNBC have done,” Steinberg says. “CNBC, it has magazine shops at airports. I don’t even know what the CNBC shops are. CNN has the Airport Network. We are trying to follow that model, our content is ideal to be watched in the background, as well. The deal actually started with an offhand comment by a journalist, asking why Cheddar wasn’t on the gas station TVs yet. McCaffrey replied to Steinberg on Twitter, offering to speed that process along. “It was a classic example of right place, right time,” McCaffrey says, adding the millennial audience of Cheddar aligned nicely with GSTV’s target audience. “More millennials stop at a GSTV station in a given month than Starbucks. It is a captive few minutes where we want to entertain somebody,” he says, noting people often refuel their cars while out shopping, and spend 1.7X more than they typically do following a fuel transaction.